Located close to Sandy Bay. 5 minutes walk from Nissi Beach and 5 minutes walk from Sandy Bay. 20 minutes walk to town centre. Aktea holiday village is a well maintained complex in an unspoilt sea front location just a few minutes walk from Nissi Beach. It is very smart looking and modern with a good range of facilities and amenities. The location combines the sandy golden beaches of Sandy bay (around 200 meters away) and Nissi Beach (around 200 meters away), with the rocky formations of a virgin landscape, the privacy of seclusion with the centrality of a cosmopolitan tourist resort. 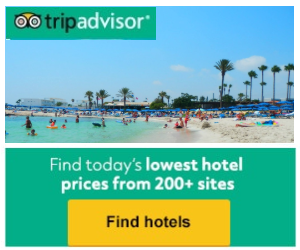 It suits families and couples and those looking for a quieter Ayia Napa holiday a little away from the busy nightlife but still within easy reach of all that Ayia Napa has to offer.